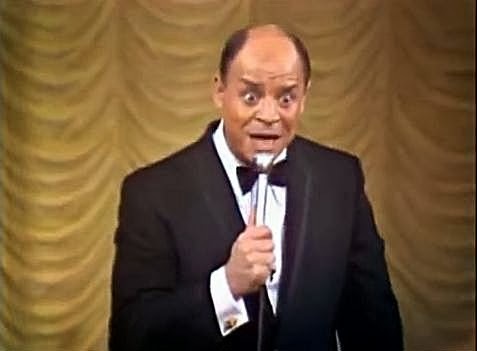 Don Rickles, known as an insult comedian, has been doing standup comedy for decades and is still going strong at age 87. We've posted a few highlights of his career in the last few years. Today, as we start a new year, we're sharing a stand-up routine that he performed in 1969 in front of an all-star audience of comedians, singers, actors, and entertainers. Rickles spares no one as he lets the insults fly and doesn't adhere to today's politically correct standards. Maybe that's what makes him so funny as he does a routine with Pat Boone that recalls the days when Native Americans were called Indians. In the course of this 14 minute video, Rickles manages to sling insults and funny comments at Ricardo Montalban, Dean Martin, Danny Thomas, Ernest Borgnine, Bob Newhart, Macdonald Carey, Dom DeLuise, Joey Heatherton and Caterina Valente. One minute before the end of the sequence, Bob Hope makes a surprise appearance. Just FYI, The "Seminole Indian Tribe of Florida" (that never surrendered to the U.S. government!) has "Indian" very prominently in its official name. If you look at http: //en.wikipedia. org/wiki/List_of_federally_recognized_tribes you will find MANY tribes with the word "Indian" in the name. So maybe only the palefaces take umbrage with the word and take "PC" where it is neither wanted nor needed. Beyond that, the Florida State University "Seminoles" are supported by the tribes in Florida and no one takes offense at the Indian-as-trademark (as long as FSU wins ).